Ukraine currently is a poor, uncontrollable and insolvent nation, which suits US interests but poses a colossal problem to Russia, the head of the Russian Presidential Administration has said. “Russia is interested in Ukraine being a friendly, independent state that is capable of providing for itself. Today’s situation causes a great concern on our part. 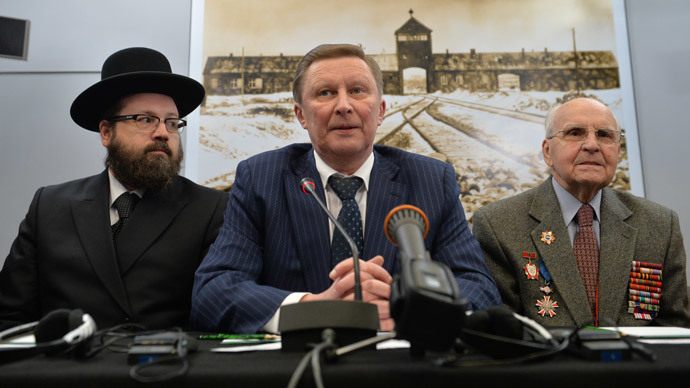 Poor, uncontrollable, legally incapable and insolvent Ukraine is a colossal problem for Russia,” Sergey Ivanov told reporters at a press conference in Auschwitz held in connection with the 70th anniversary of the death camp’s liberation by the Red Army. “American partners are simply using Ukraine for their own needs, they don’t care about Ukraine itself. And it is the Ukrainian people that would have to face the consequences, while being on the brink of misery,” the top Russian official noted. Ivanov also told reporters that, in his view, the chances for peaceful settlement of the Ukrainian conflict still exist, even though it was difficult to look at the situation with optimism. He added that peace could be achieved through immediate ending of artillery raids and direct talks between Kiev and the self-proclaimed republics in Donbass. The guarantor nations can confirm it, they can facilitate the start of negotiations, but they cannot make decisions instead of the participants in the conflict, Ivanov stated. In comments on the Ukrainian parliament’s recent decision to recognize Russia as an aggressor, Ivanov called the move “weak-headedness” but noted that it had not come as a surprise. “I would not be surprised even if the State Rada tomorrow passes a resolution claiming that Russia had launched an aggression on the Moon,” the Russian official said.